Just as Emmanuel Macron, the French president, prepared to record a highly-anticipated address to the nation to be broadcast on TV later, flames were overwhelming Notre Dame Cathedral. Macron’s team first thought of postponing the broadcast, which was scheduled for 8pm (local time), before it became clear that the disaster was so grave it would have to be cancelled altogether. Instead, the president went from the Elysee to Notre Dame and stood among the crowds, looking as flabbergasted as the rest of us, stunned by the violence of the flames and the extent of the devastation. At exactly 7.53pm, the spire of the world’s most famous cathedral snapped in two and collapsed into the furnace. Macron’s address was to have been a key political event after months of unrest unleashed by the “gilets jaunes” uprising, which first prompted and then threatened to derail Macron’s “great national debate” on the future of the divided country. It is a movement without parallel in recent French history, disparate, leaderless, legitimate in its initial demands, but containing elements that are violent, racist, populist, undemocratic, with no other aim than taking over the institutions of the Republic? How could the president provide an answer to something he partly provoked himself, by ignoring the fact that many French people, even those with jobs, simply cannot afford a decent standard of living? This is why the president’s address was so eagerly anticipated. His political survival turned on what, if any, reforms he would put forward. These big questions remain unanswered. But at 8pm, the French didn’t get Macron on their TV screens, they got flames engulfing Notre Dame, our dear great old lady of Paris. And a political turning point turned into something a great deal more raw and emotional. Like thousands of other Parisians, I went down to the banks of the Seine to pay my tribute to Notre Dame. We gazed at the burning cathedral as night fell. The quiet was striking; people had tears in their eyes, but scarcely any words to express their sadness. Some gripping rosary beads sang Ave Marias and recited prayers. There was warm applause for any firefighter who made his way out of the fire and back on to the street. Why were we so heart-broken? First, because to Parisians, Notre Dame is a great deal more than a monument. She (and we think of her as a great old lady) is a familiar figure, a strong character, an enduring feature in our line of vision. Victor Hugo knew what he was doing when he featured her in his famous novel, as human as Quasimodo the hunchback or Esmeralda the martyr. Paris is a small city, and Notre Dame feels like part of our daily life, positioned at the centre of the city, at the very crossroads of the nation. On my motorcycle, I pass by it almost every day, going up the rue Saint Jacques and crossing the river from north to south. On Monday night, there were no believers or unbelievers, we were all mourning. I doubt if I was the only one to feel guilty at not having visited the cathedral more while she was still alive, just as we might regret it when someone we love has passed away. Another feeling moved through our sorrow: it is hard not to see the fire as symbolic. We have been a wounded city for some years and now are a wounded, disunited country. As Parisians and French people, we have endured the fear of terrorist attacks, we currently live under the threat of violence provoked by the gilets jaunes’ protests every Saturday, some of it coming from the police. It felt oddly reassuring that the fire was not any kind of attack, but an ordinary, banal accident. In a way, there was a sense of relief not to be told we must suspect a criminal hand and I wonder if the atmosphere would have been quite so gentle and peaceful if it had been otherwise. The burning of Notre Dame seems to have confounded our collective rage and our tragedies. Like Britain at the moment — although for different reasons — we are exhausted; tired of being endlessly scrutinised over our failings; at the mercy of wild, unpredictable choices; democratically unstable and politically broken. Notre Dame caught us all off guard, and suddenly it was as if “the elites” and “the people”, supposedly sworn enemies throughout the modern world, if we must believe the current populist narrative, had, in France, made up with each other for a while. 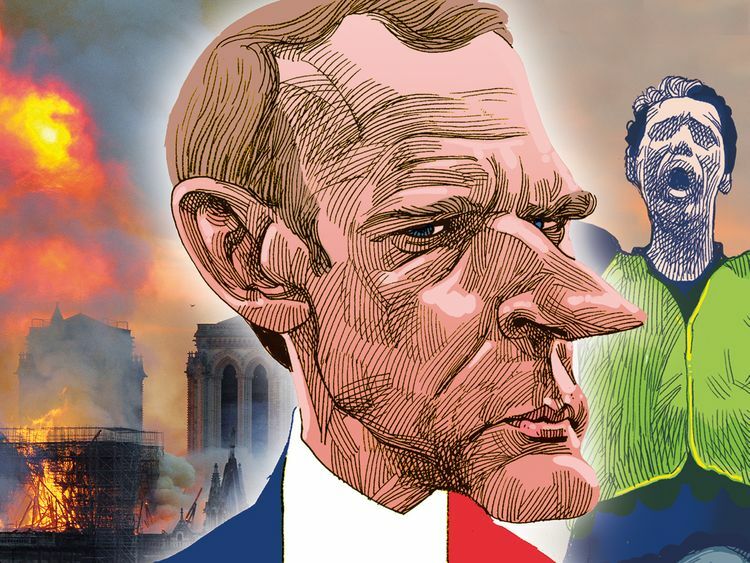 All at once our French warring tribes — the liberal elites, the gilets jaunes, the young, the workers, the Catholic right — all united in grief at a visible disaster. It was as if the French nation wanted to hit pause, the normal business of life suddenly interrupted by an event none of us saw coming. The cathedral is mercifully still standing. That is some relief as we begin the national conversations about the cost of restoration. How long will the unity of purpose last? Marion Van Renterghem is a noted French journalist.